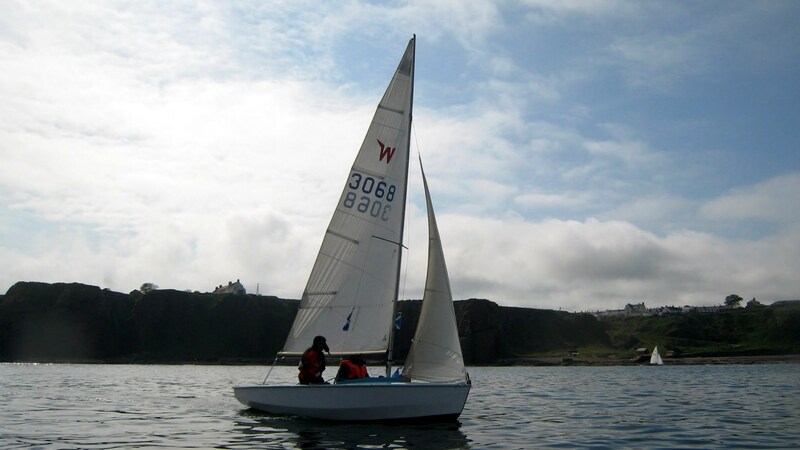 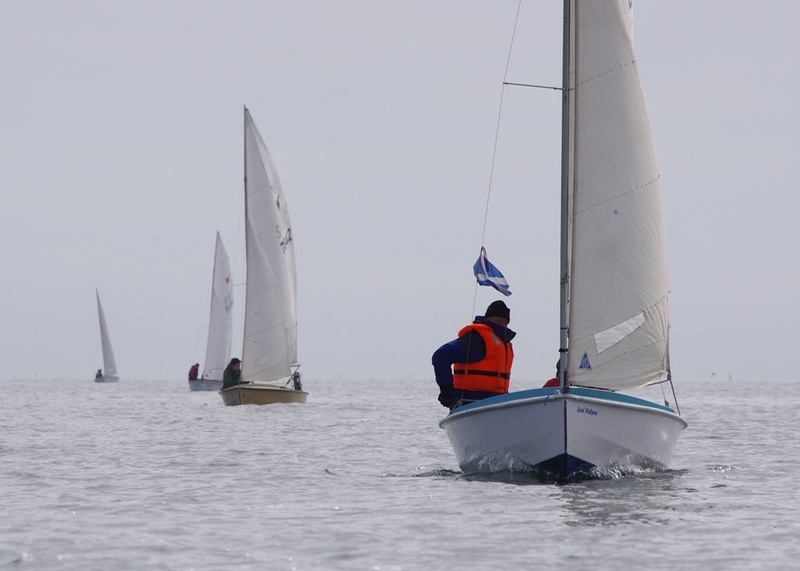 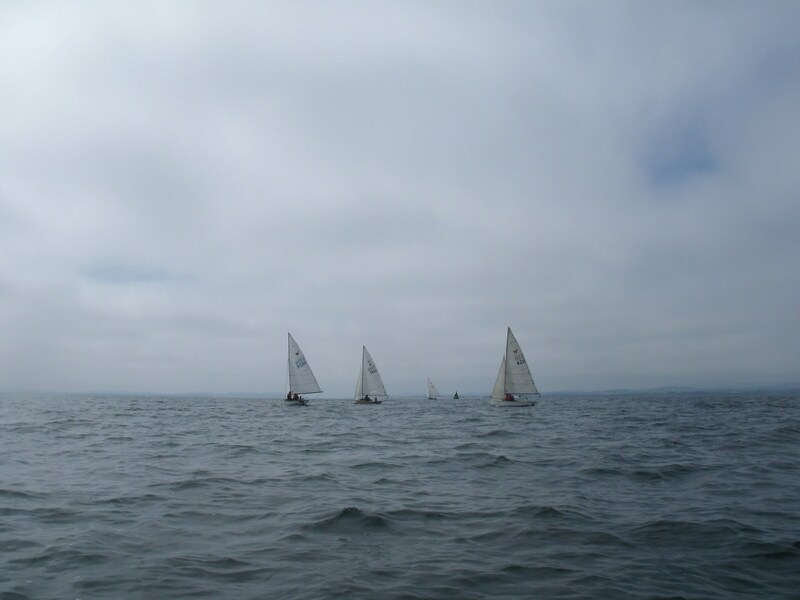 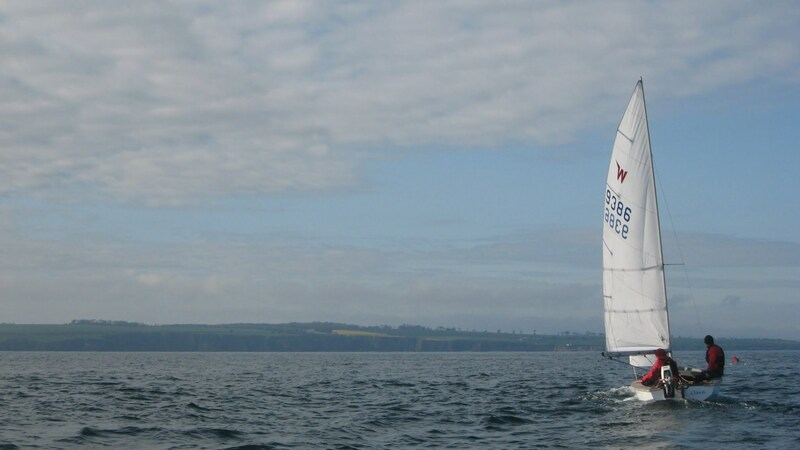 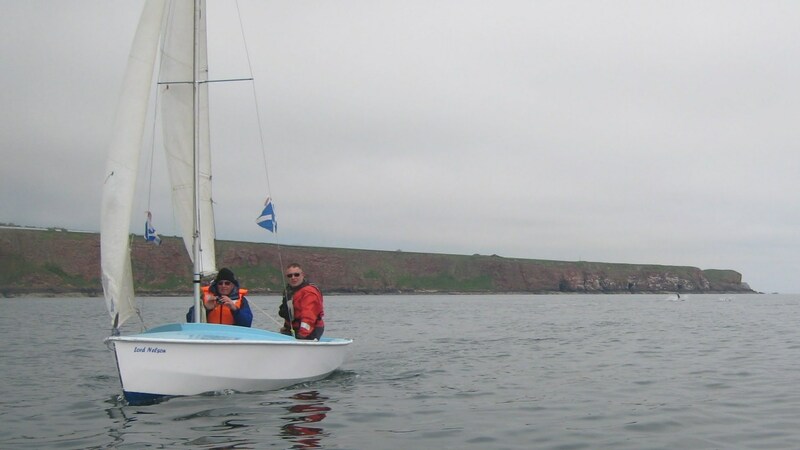 For the second year running, sailing to Lunan Bay was to be the annual highlight for the more experienced members of Dundee Sailing Club and it was a privilege for me to be among them this year. 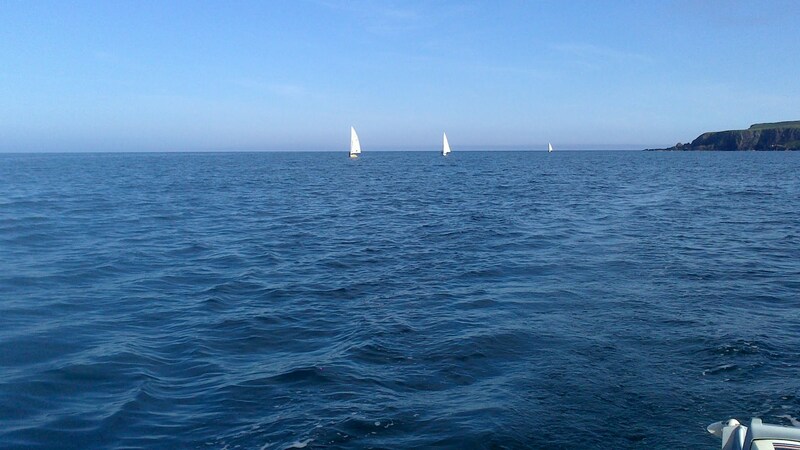 Six boats headed out into the dark looking North Sea on Saturday morning. 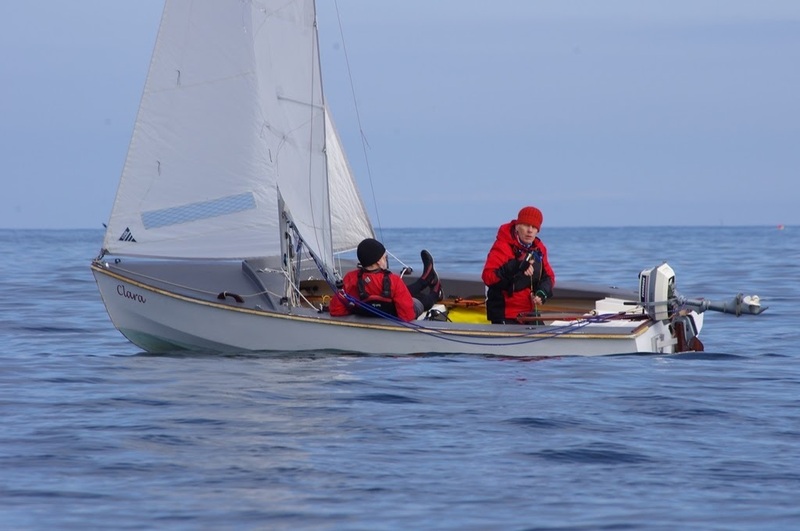 The forecast was for moderate to calm wind and the sizeable waves at the mouth of the Tay were an enjoyable challenge at the start of the trip. 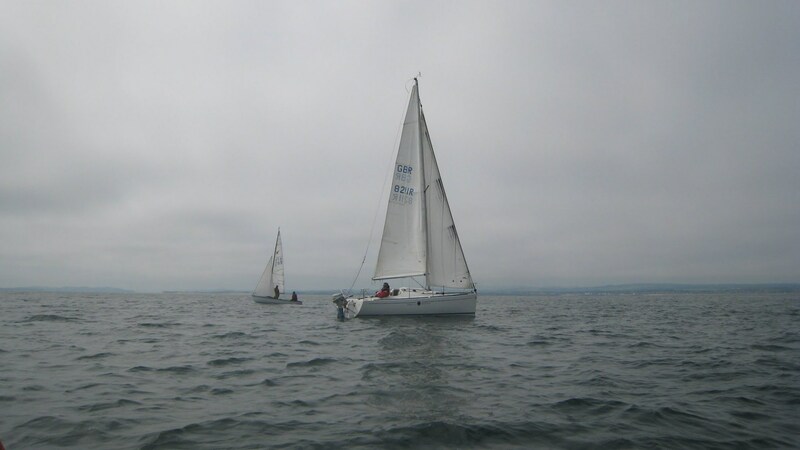 The boats mustered by the Abertay Buoy before continuing when thick fog reduced visibility. 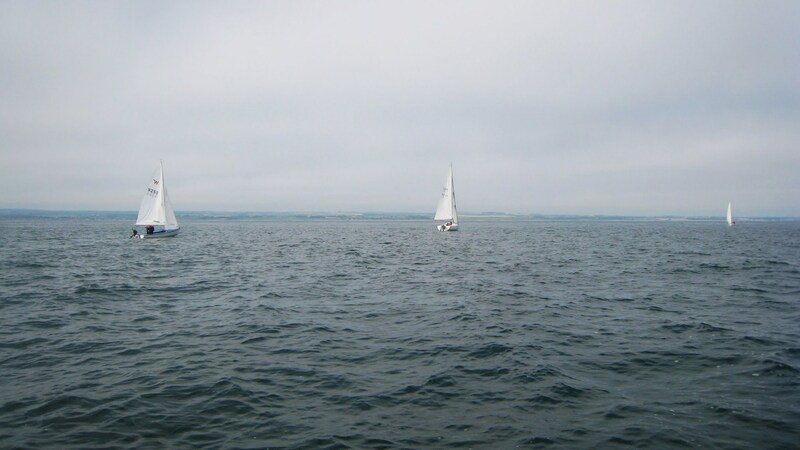 While some of us enjoyed the dolphins out at sea others stayed closer to the coast and we all agreed to regroup at Carnoustie. 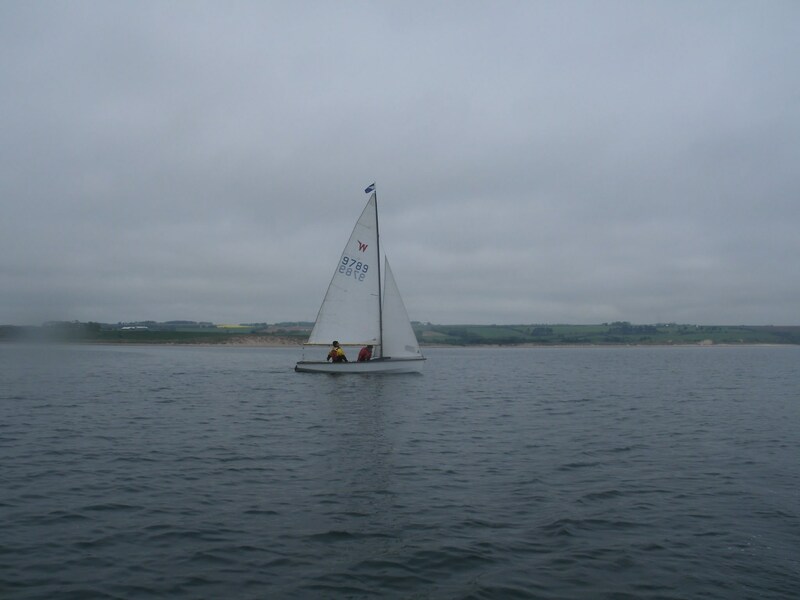 It was now a case of following the compass or following the coastline. 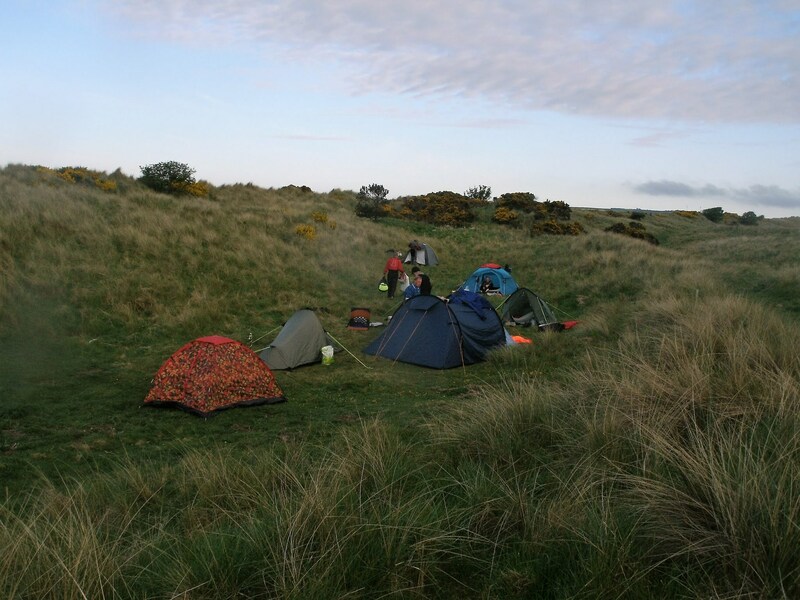 It was a good lesson in realising how disorientating thick fog can be – and how great a reliable compass is! 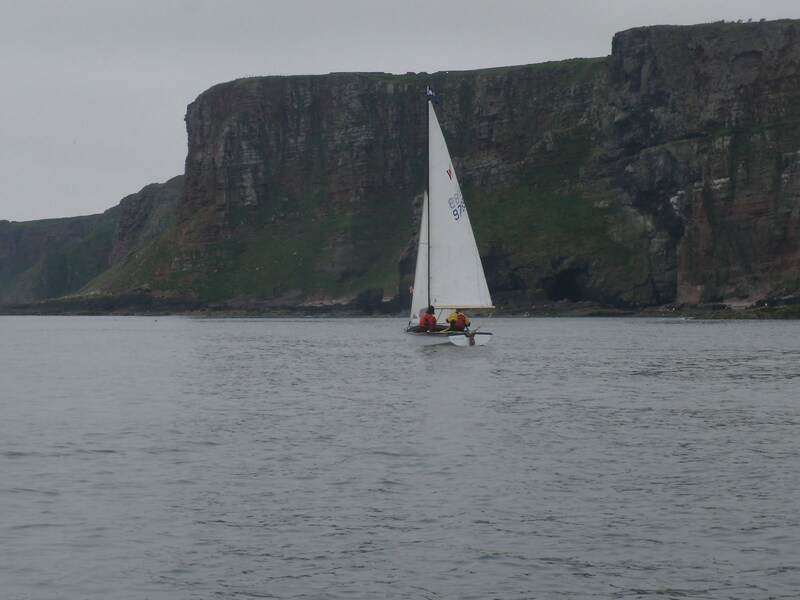 While we waited for the others to catch up (the coastal route being longer) visibility improved and the wind started to calm down so once we were all together again we had to spend some time zig-zagging between lobster pots in slow winds – that’s when I remembered my daughter asking “isn’t it all a bit samey”? 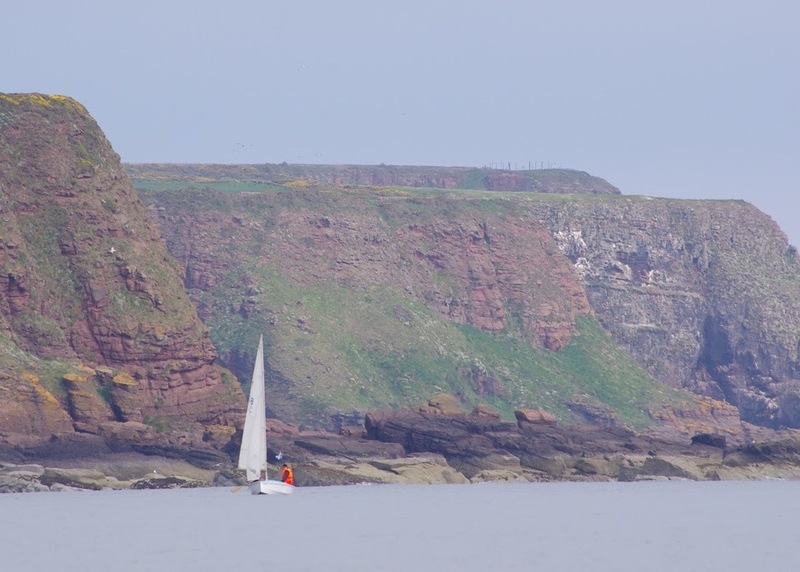 Well, maybe for parts of the trip but the rewards are huge: as soon as we were past Arbroath Deil’s Head we enjoyed great sailing along the cliffs with all the seabirds. 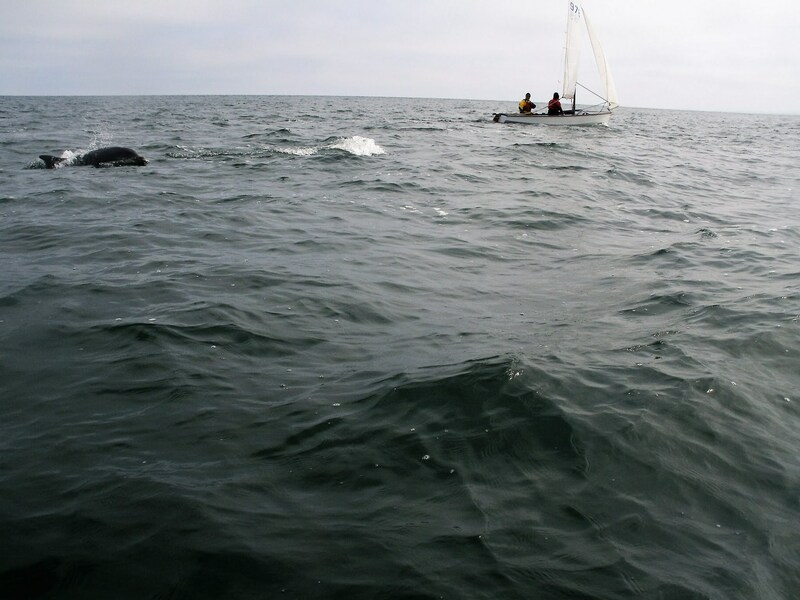 Their cries filled the air, some dived or took off from the water right beside our boats, we saw puffins and the crew of one boat even spotted a baby seal. 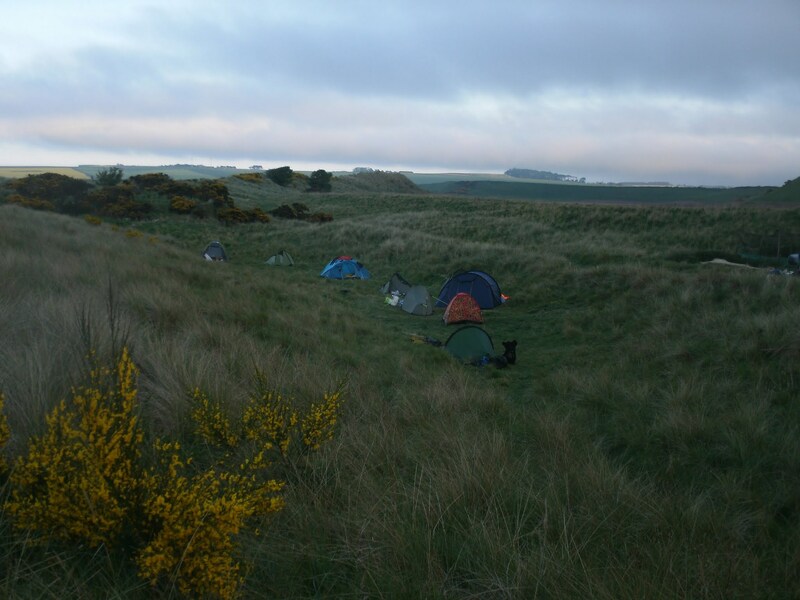 It was absolutely magical – better than any wildlife programme! 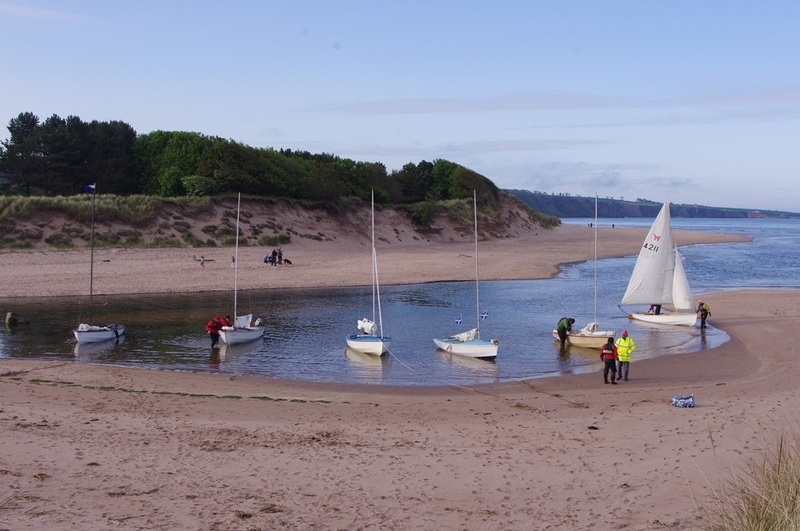 By the time we reached Lunan Bay the last bit seemed rather slow again as the wind was dying and our tummies were rumbling. 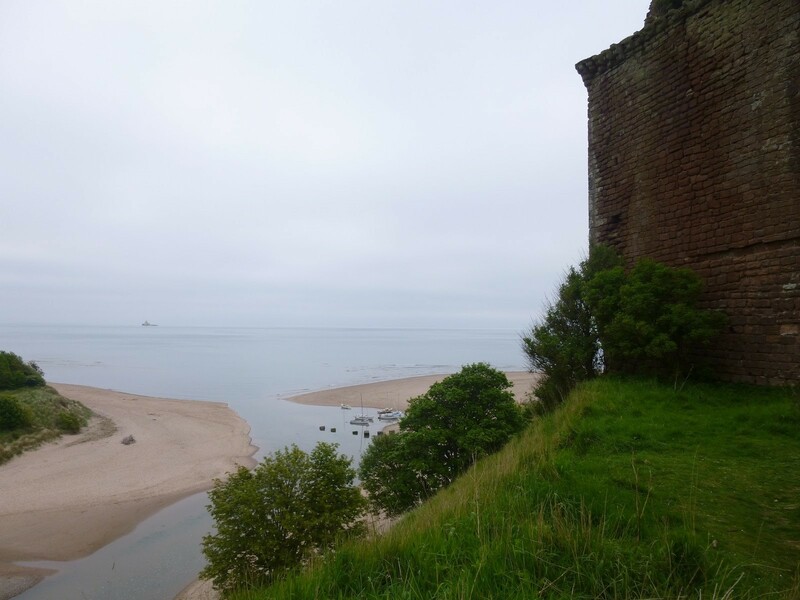 But again the reward was great: a most beautiful landing spot in the mouth of Lunan Waters under the sandstone ruin of Red Castle where the friendly landowner had allowed us to camp overnight. 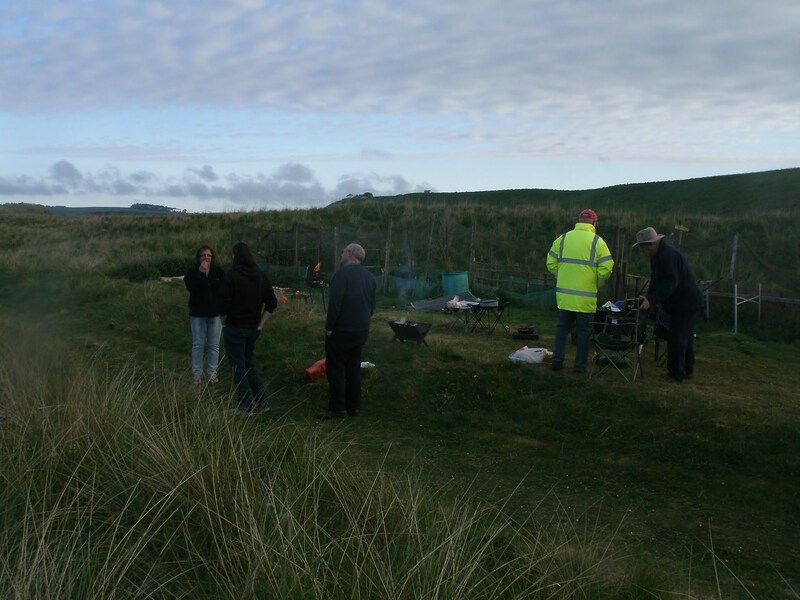 The boats were soon secured, the barbecues were lit and we were joined by a few more members of the club who had come up by car. 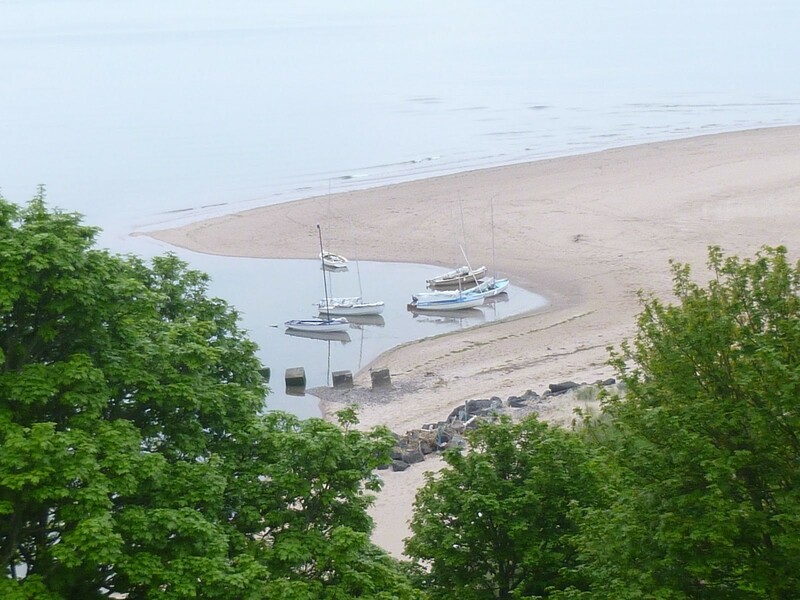 And it sure is true that sea air makes you hungry! 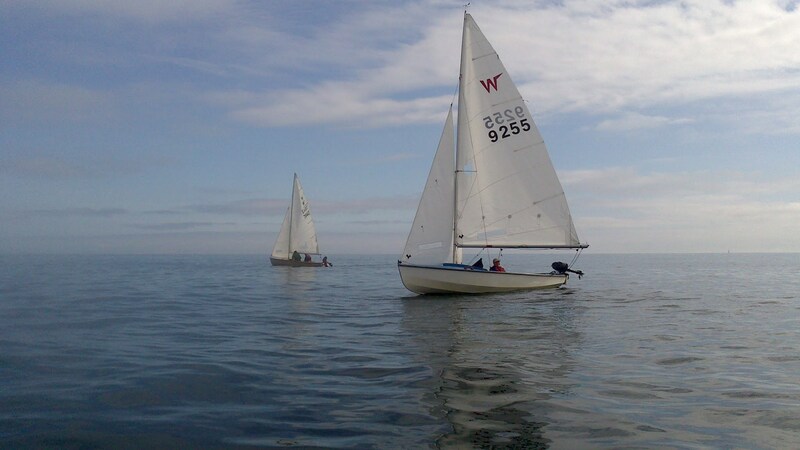 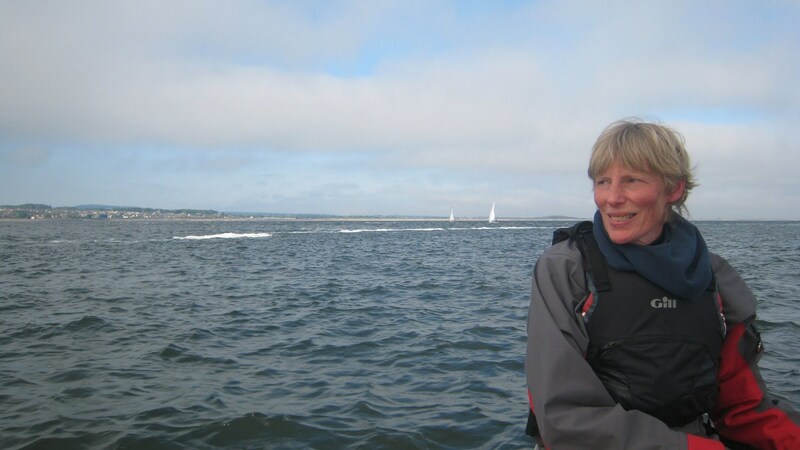 Now suddenly the calm evening which had slowed down the sailing became a true blessing – while Dundee was covered in haar we enjoyed late evening sunshine and no wind for our barbecue and a wonderfully still and calm night for camping – it couldn’t have been better. 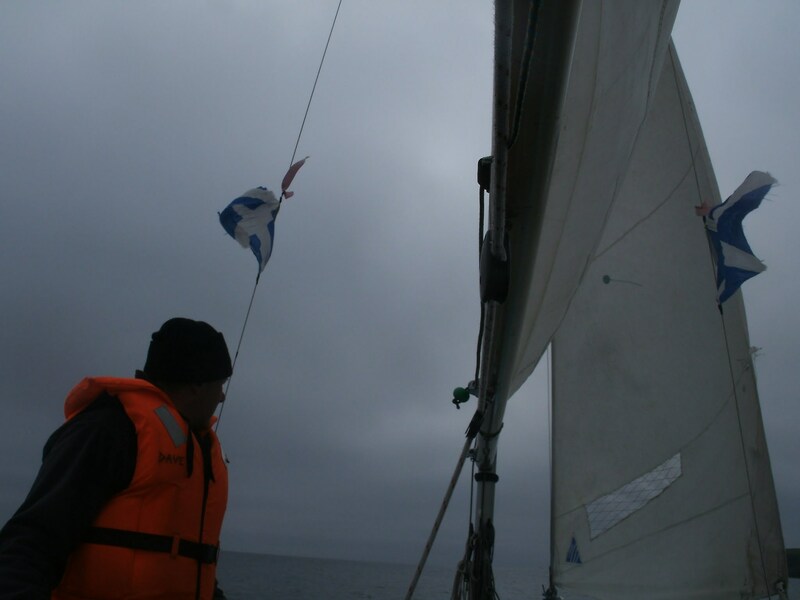 The next morning greeted us with a light grey sky – which was significantly better than the warning of sea fog coming our way. 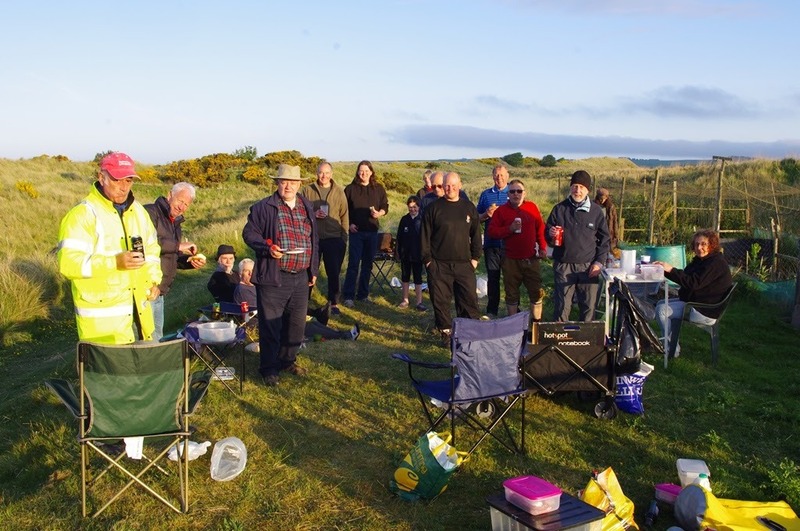 All sailors enjoyed a leisurely breakfast waiting for the wind to pick up a little and some took a wander around the dunes or to the castle. 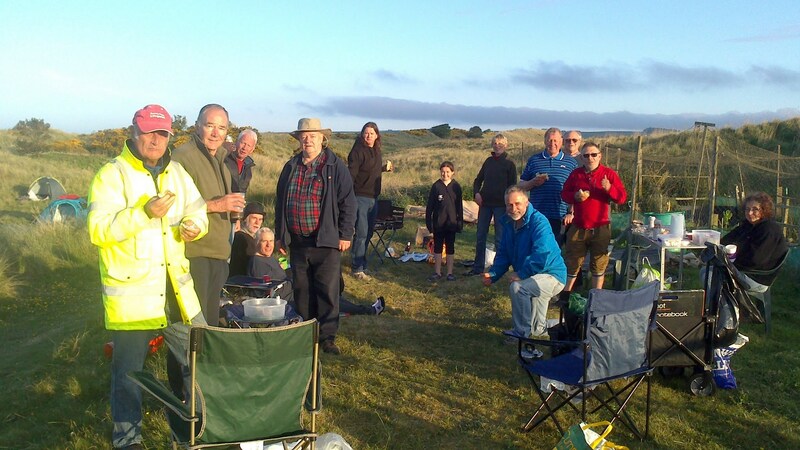 It seemed almost sad to leave – it had been such a friendly place and most of us were already looking forward to next year – and some may bring fishing rods as the landowner had mentioned turbot and sea bass! 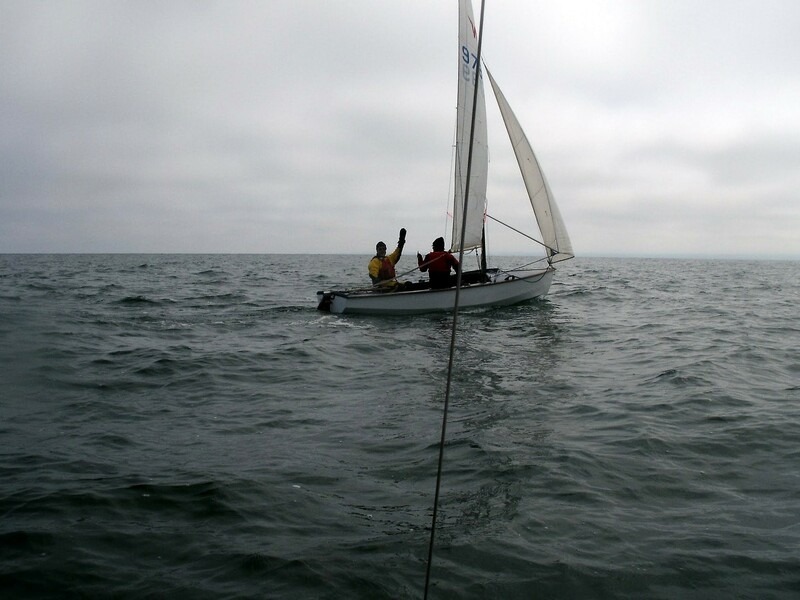 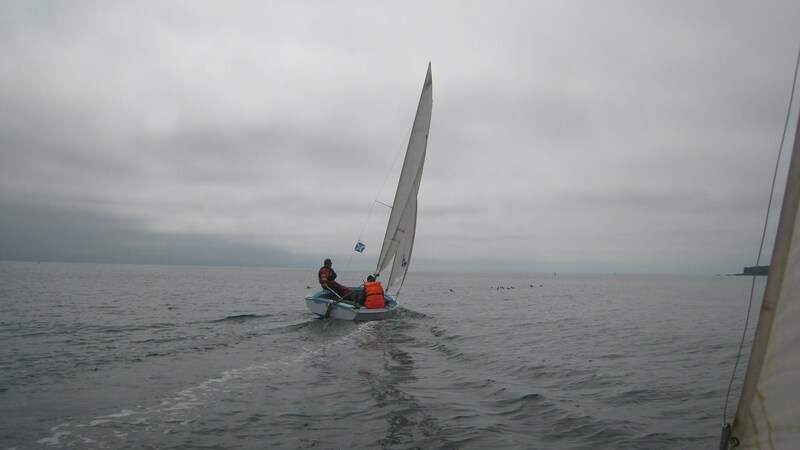 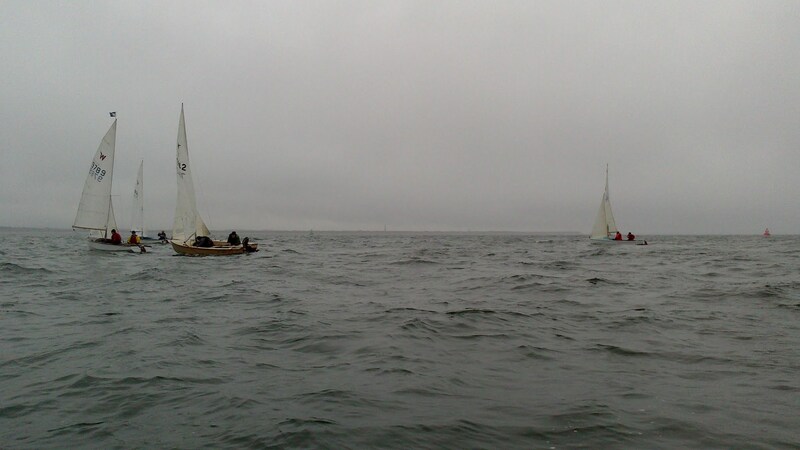 By 9.30 all boats were on the water again slowly tacking out of the calm bay, some with the help of paddles. 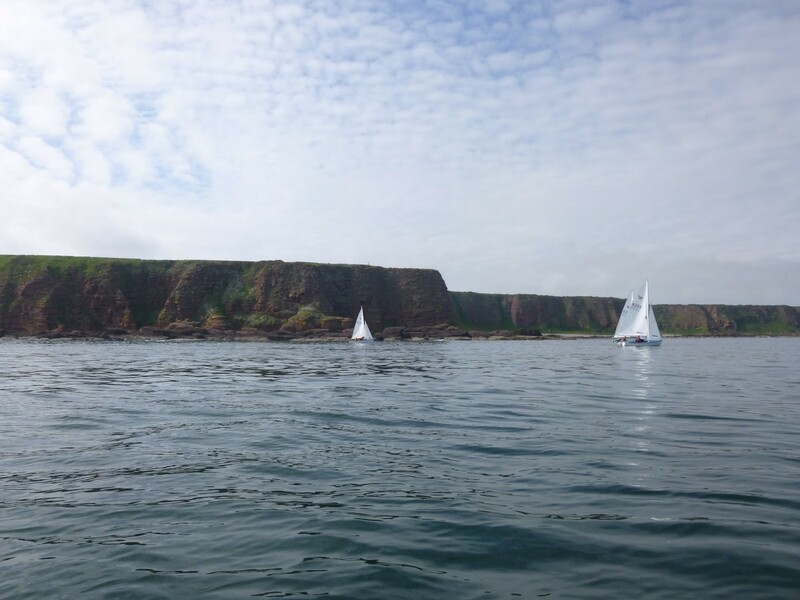 Again we were rewarded by bird life once we reached the cliffs and by a magnificent display of dolphins leaping right out of the water. 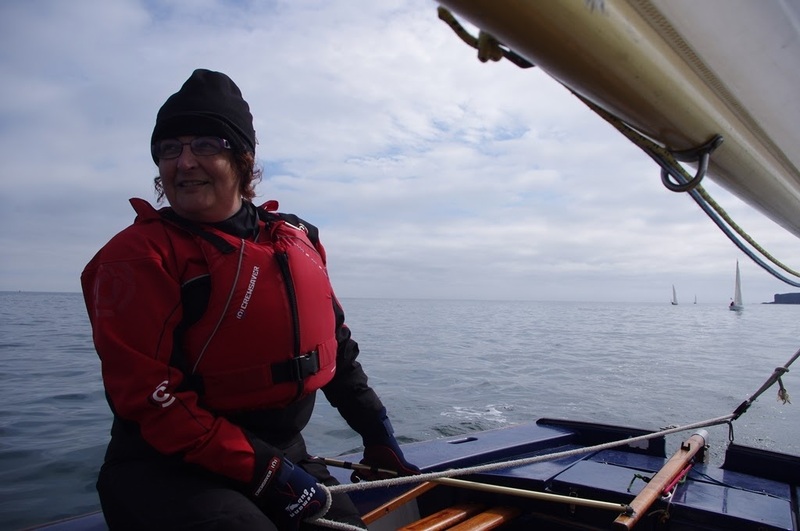 There was yet more paddling needed at times until the wind picked up and allowed better progress through the lobster pots – this time in a straight line. 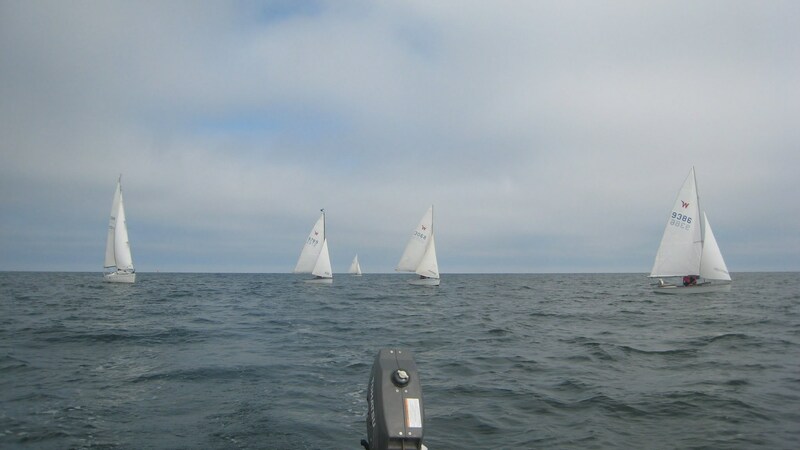 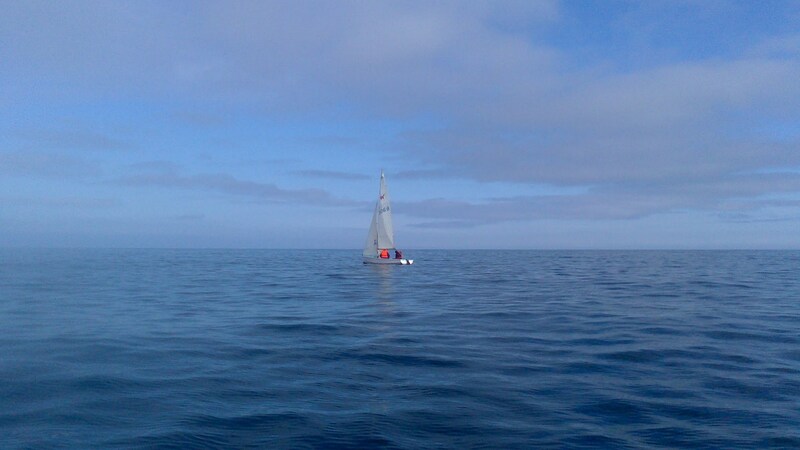 Again the boats got separated a bit but it didn’t matter as visibility was good and conditions calm. 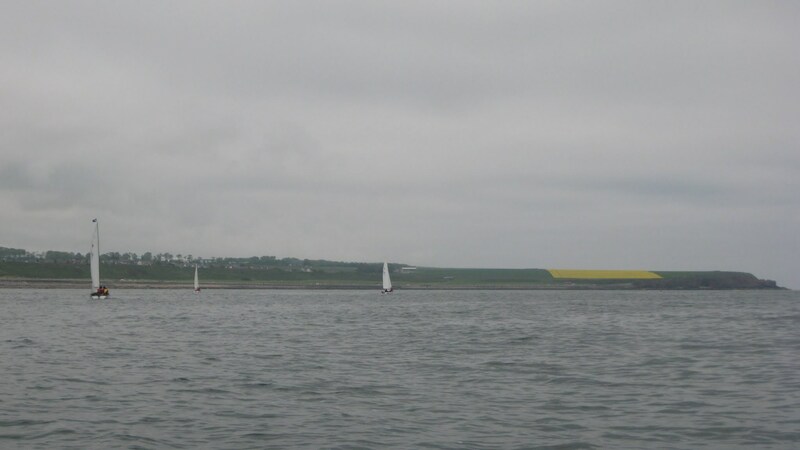 All the boats mustered close to the Abertay Buoy and were once more rewarded by playful dolphins. 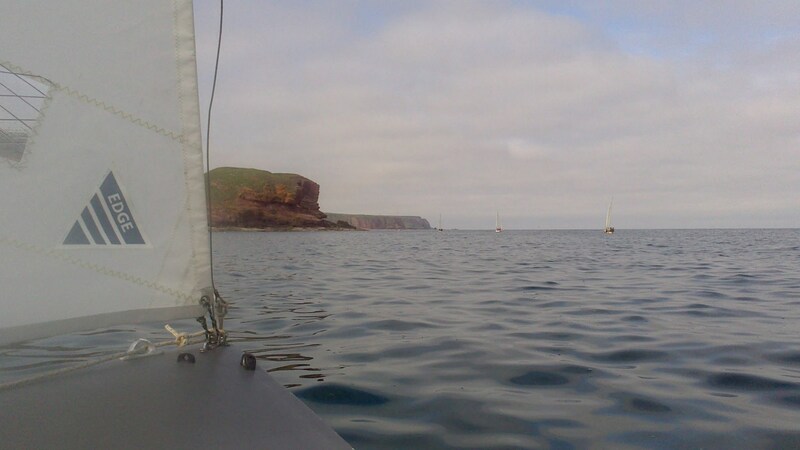 The tide and a good wind took us home in glorious sunshine - easy sailing in one long run right to Grassy Beach. 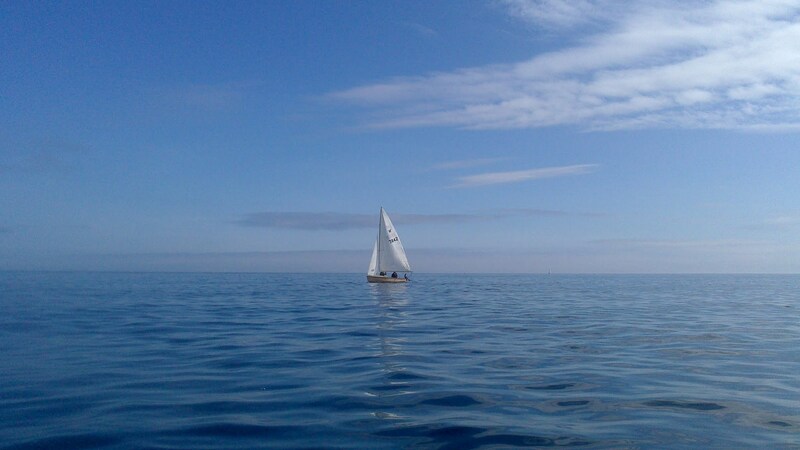 What a wonderful trip and what perfect conditions: not a single moment of genuine risk, not a single raindrop, and all of us got home with a healthy appetite and a good bit of sunshine on our faces and in our hearts.